Occasionally, events come up which remind me why I started Liner Legal and motivate me to do the best I can for our clients every day. 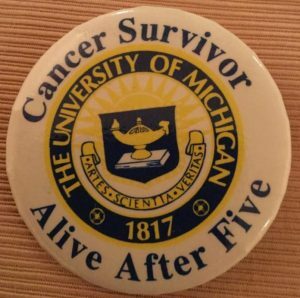 On October 23 my dad, David Liner, received his five-year cancer-free pin from the University of Michigan Cancer Center. Growing up, I wanted to be just like my dad. To this day he is the smartest and toughest person I have ever met. Until he retired last year after a successful career as a lawyer, he was also the hardest worker I’ve known. There were times as a child I remember being upset that my dad would work long hours at the office, only to come home and work more. As an adult, I now realize that it was just as much his sacrifice as it was my own. After a few years of being a lawyer, my dad was diagnosed with a form of tongue cancer in 2012. I will never forget how helpless he looked when he came out of surgery to remove the cancerous portion of his tongue. I was struck with feelings of guilt and shame from the fact that I could not do anything to assist a man who had effortlessly moved mountains for me my entire life. Fast forward five years, and my dad has kicked cancer to the curb. I am thrilled to have this part of my family’s life in the rearview. Additionally, I pledge to each of our clients to always carry with me the memories of my dad after surgery. Even though I was unable to do anything to help my dad that day in the hospital, I am absolutely empowered to help my clients face their own challenges when sick or injured and fighting Social Security or private insurance carriers for a disability income to afford basic necessities. Just one more lesson passed from father to son. September 2013. It was the month I made the decision to “hang a shingle” (as lawyers are fond of saying) and start my own law firm. I could never have imagined what Liner Legal would become in such a short period of time. 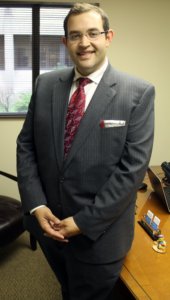 Through trial and error, we have transformed into one of the largest and most reputable disability law firms in Ohio. We have helped thousands of people obtain disability benefits—including millions of dollars in social security back payments. Liner Legal started out in 2013 in a tiny attic office in Euclid, Ohio. We moved offices twice in the Cleveland area to accommodate our incredible growth. In addition, we are proud to serve clients in Akron, Canton, Youngstown, and Sandusky from satellite offices in those communities. I spend a lot of time thinking about how to give back to the clients, referral partners, and communities that have supported our growth. The monthly newsletter is one small way I can give back. It has articles about important changes and updates in Social Security. Additionally, it has information about local businesses, organizations, physicians, and support groups friendly to the disability community.